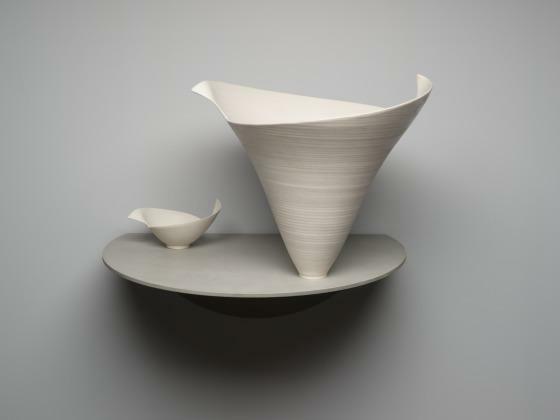 Elsa Rady's elegant ceramic works blur the line between sculptural art and functional design. Continually revisiting familiar forms - vases, bowls, and bottles - Rady creates recognizable objects that are not necessarily practical. This piece is composed of abstract bud and flower forms attached to a sand-blasted aluminum circle. The circle has been folded once, and the underfold attached to the gray walls to form a shelf. Any function as a vase is largely denied not only by the form, but also because the work is fixed to a shelf and intended (as the title suggests) to hang on the wall and be regarded as an art object in its own right. Rady's work is a nod to the ancient tradition of ceramics and porcelain, while also reaffirming the vessel as high art. Of her process, the artist explains, "when I started the Lily series, I would take a piece of silk, raise my arm, and let the material fall. I incorporated this chance movement into the petals of my pieces. Working with chance has always been an important part of my mature work. I love the unexpected spin the flight of a discarded piece as I throw it away. My still life shelves take up the same space as a painting and make people look in a new way." Through its title and shape, Lily Still Life No. 47 subtly suggests the delicate form of a flower and also references the name of the artist's mother, Lily. Alfred Leslie, Elsa Rady: Still Life (Exhibition Catalog, June 29-July 4, 1991) Tokyo: Isetan Shinjuku. 1991. John Perreault, Elsa Rady: Lily (Exhibition Catalog, Holly Solomon Gallery, NYC, February 15-March 17, 1990) Rhode Island: Meridian Printing, 1990. DMA unpublished material, Label text [2007.69.a-c]. See another Rady Still life.